Fr. Miguel Goñi Ariz was born in Imarcoain (Navarra) April 27, 1902. Manifesting the desire to become a priest even as a child, he would enter the Redemptorists on September 8, 1918 and professed his vows on August 26, 1920. Despite poor health and a shy nature, he was ordained a priest on September 27, 1925 and proved to be a strong and tireless preacher of popular missions. 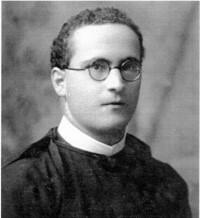 After serving in the communities of Nava del Rey (Valladolid), Granada, Santander and Vigo, he was transferrred in 1932 to Cuenca, where he ministered especially in the Redemptorist Church of St. Phillip Neri. On August 31, 1936 he was arrested by the militia, shot and left to bleed to death.